Here is more from our set visit with effects wizards and the young actress who plays dolphin Winter’s trainer. 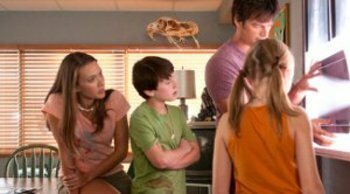 We’re taking you back to Clearwater, Florida and the aquarium there for more set visit interaction with the cast and crew of Dolphin Tale, the true, 3-D story of Winter, the remarkable dolphin who, as a baby, got her tail caught in a crab trap. 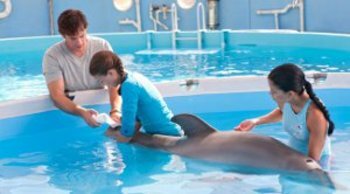 Unable to swim and dying, she was brought to the Clearwater Marine Aquarium where the specialists worked diligently to keep her alive and nurse her back to health. 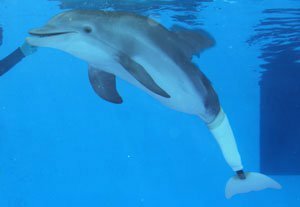 When Winter’s injured tail fell off, her medical team thought she was doomed until a man with a prosthetics company volunteered to make her a tail. Now Winter, who still resides at the aquarium, can swim and leap with the best of her pals. The research has also helped human patients who have lost limbs. While on set, we got to tour the effects shop where the KNB creature builder guys were keeping “Robo-Winter”, a full animatronic copy of the real dolphin. They measured the real Winter and matched any scars then sculpted, molded and added skin and paint. “Robo” weighs about 300 pounds. The guys also built some tail pieces to be on camera because they didn’t want the real Winter to thrash her tail around. Real dolphins reacted to the animatronic dolphin with curiosity. KNB also built a “stuffy” called Summer which is a softer and lighter stand-in. What you’ll see in the film is a combo of real Winter, CGI and the animatronic stand-ins. We also met “Rufus”, a huge pelican rod puppet that looked sooo real. The guys demonstrated Rufus biting at pant legs and being generally mischievous. Hilarious! Later, in “video village” where the director and crew watches what they’ve shot on monitors, we put on 3-D glasses to check it out. We toured an actual aquarium on the top floor where scenes were shot and later conducted our interviews inside the set for Harry Connick’s marine biology office. Austin Highsmith is a pretty 20-something playing Phoebe, Winter’s trainer. She sloshes over in her wetsuit to share with us all kinds of cool stuff about dolphins and her fellow cast members. Kidzworld: Describe your character Phoebe. 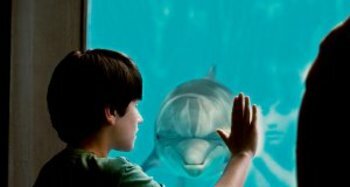 Austin: I’m the head dolphin trainer at the Clearwater Marine Aquarium so I’m basically Harry Connick’s right hand person. Any in the water interaction that Winter has is through Phoebe’s training and that is though what (real trainers) Abby (Stone) and Elena have taught me about how to interact with the dolphins. Abby was here when the real Winter was brought in. She was only 40 pounds and Abby was walking her around and bottle feeding her. I’m mimicking that a little bit but it’s an older version of Winter in the movie. I’m nursing her back to health and teaching her how to use the mechanical tail that we give her. Most of my scenes are with the two kids and Harry and Morgan as well. Kidzworld: We hear that Morgan sings between scenes and Harry is the set prankster. Austin: Yeah. Harry’s a big goofball and he’s very real. Morgan is friendly and joking. The two of them were keeping rhythm on a fish cooler. Cozi (Zuehlsdorff) was tapping her feet and Morgan was singing while Charlie (Martin Smith, the director) was trying to set up a shot. We were all focused on them. Charlie is an actor too so he’s right in there with us. He wrote the last version of the script too. Kidzworld: What do you like most about playing Phoebe? Kidzworld: What was your audition like for this? Austin: Unusual. 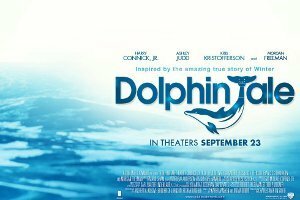 Every single scene was holding a dolphin. I read with the casting assistant. Three weeks later I get a call to meet with the producer. I went in and spoke with him and I got it. Wow, you can go meet with really nice people then go play with dolphins? Kidzworld: So Winter herself didn’t have to “approve” you? Austin: Winter is used to working with women but she had to approve the little boys because she has more scenes with them. According to Abby, she’s more used to females, not little boys. She hates hot pink and she doesn’t like dark, large pieces of fabric. We don’t know why. They had to get her used to the camera. She got used to the word “rolling”. Kidzworld: Do you think she actually knows you as a certain person? Austin: I always joke that she’s like “Oh, the fake trainer is here. I’m gonna have to do something I don’t want to do”. She is much more comfortable with me now because they had me doing a lot of stuff I’d be doing in the movie with her for several weeks before we started shooting so she does know me. I got to “dance” with her underwater. Also I was swimming laps with her which nobody has done with her before and she looks at me like “You’re fun!” She totally knows me. Kidzworld: What surprised you most about dolphins? Austin: How cognitive they are. We were feeding the boys one night and one of the fish was a little bit frozen and he spit it out and looked at the trainer like “Really? You’re giving me a frozen fish?” They’re incredibly sensitive. You think that a wild animal could eat anything and be a scavenger if you will but they are top of the food chain so they only eat the best fish. While shooting the movie, I’ll set aside a fish if it’s (damaged). Bacteria can kill a dolphin. They take stress a lot internally like we do. Kidzworld: Do they talk to you? Austin: Winter will echo-locate on me when I’m swimming underwater and I do something that she thinks is funny. It’s like an (high-pitched) “Eeeeeeeeeee” noise. And she’ll blow bubbles and trill. When she’s really excited on the top of the water when she’s done a behavior really well, Winter will make lots of little squeaky noises. They mimic whatever sound they hear the most and that is the trainer’s bridge, like a dog whistle. They have three different levels of fish to give them. The herrings are for “You did something great!". Kidzworld: People are saying it stinks like fish in here. We’re been here a while so we don’t smell it. Austin: I’m used to it. Otters really stink but they are soooo cute you don’t care. Come back to check out more interviews with the cast and catch the film on screens Sept. 23rd.